South Africa wicketkeeper Mark Boucher has retired from international cricket after suffering a severe eye injury during his country's tour match against Somerset, team captain Graeme Smith revealed on Tuesday. 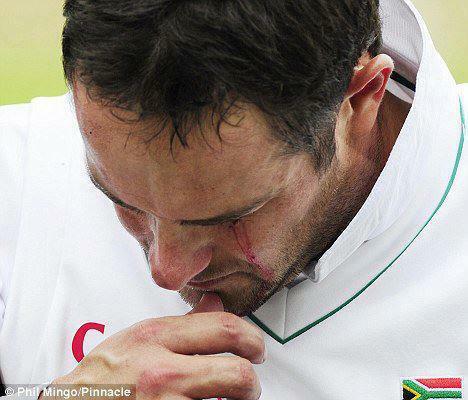 Boucher had to undergo three hours of surgery on a "laceration" to the white of the left eyeball on Monday night after being struck by a bail on day one of the Proteas' tour match at Taunton. The incident occurred when a ball from spinner Imran Tahir bowled Gemaal Hussain, with Boucher standing up to the stumps and wearing a cap instead of a helmet. He immediately hit the ground and was helped from the pitch with blood apparently coming from his eye. The 35-year-old was due to return home after being released from hospital on Tuesday morning and Smith, speaking at Taunton, read out a statement on Boucher's behalf that confirmed his retirement from South Africa duty. "It is with sadness and pain that I announce that I will not be able to play international cricket again," Boucher said in the statement. "Due to the severity of my eye injury, I will not be able to play international cricket again. I had prepared for this UK tour as well, if not better than I have prepared for any tour in my career. "I never anticipated announcing my retirement now but circumstances dictate differently. "For now, I'd like to thank a huge number of people for their heartfelt support for the last 24 hours. I now head onto a road of uncertain recovery." Boucher has been a mainstay of the South Africa side for 15 years, appearing in 147 Tests and becoming the first wicket-keeper to take 500 catches in Test cricket, where he has also scored five hundreds. He had intended for this tour to England to be his final in international cricket, with his 150th Test scheduled for the third of the series at Lord's. Smith paid tribute to Boucher's contribution to South African cricket and hailed his fierce competitive instincts, as well as his high-class displays behind the stumps and as a powerful batsman. "For the 14 years of your international career you have been a Proteas warrior. You have given 100 percent for this team," Smith said. "You are a very good friend to many of us. You leave us today with sad hearts but also with our deepest gratitude. "We have walked a long road together, and we are saddened to part under these circumstances. "You have been more than a performer, you have been a motivator, an inspirer, an energizer. The fighting spirit you brought to team remains with us. "We wish you a good as possible recovery from your injury. As we bid you a farewell as an international cricketer and wish you well for your future, we keep you as a friend and respected Proteas warrior. "If you add that to the type of person he was, he will go down as one of the greats of the game, certainly one of the greats in South African cricket. "I think now we are just more worried about Mark the person, and getting him through this situation." South Africa's team management announced that the versatile AB de Villiers, who has previously provided cover behind the stumps in both Tests and one-day internationals, will replace Boucher for the first Test at The Oval next week, but a long-term replacement, possibly Thami Tsolekile, will eventually be called up. England players Stuart Broad, Kevin Pietersen and Matt Prior all voiced their concern and admiration for Boucher via their Twitter accounts. Boucher's fellow wicketkeeper Prior tweeted: "Just seen the news about Mark. "Very sad he's missing the series and hope he makes a full and speedy recovery. Go well mate."